Get your pumpkin-spiced IPA ready because Hawktoberfest is back! This doubles tournament plays two rounds, one on The Hill and one on The General. All players (over 21) will get beer in their player pack! Plus amateurs will get at least one more item, maybe a shirt, maybe a disc. Will know soon! Flying Dreams Brewing is on board again this year! Make sure to visit their taproom opening this fall in Marlborough! And new this year we have Two Roads as a sponsor as well! 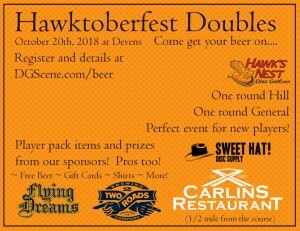 We will be having a party after the event at Carlins Restaurant in Ayer, where we nb will have both breweries on tap! All players will be getting a small gift card to Carlins too, so make sure you attend the party! Register asap, this one has sold out every year! 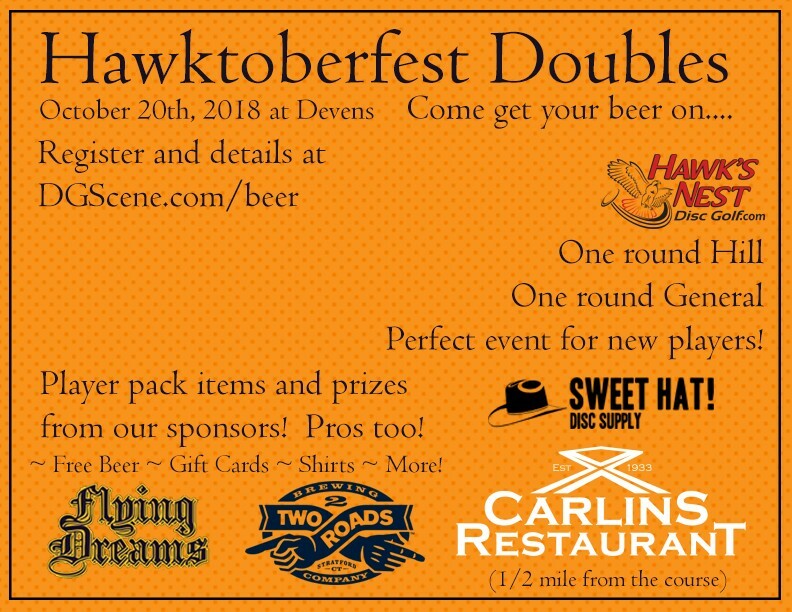 Hawktoberfest Update! Sweet Hat! Disc Supply will be in attendance doing custom dyes during the event! Come in the morning, bring your own discs or buy something from Hawk's Nest Disc Golf and it will be dyed during the event! Hawk's Nest Disc Golf is responsible for all refunds/cancelations.